I hope all of my Canadian readers had a lovely Thanksgiving weekend! I spent the weekend at the cottage with my husband's family, which was so relaxing! I just wanted to use this week's What I Ate In A Day post to share what I made for my husband and I for Thanksgiving (his first as a vegan!). I picked up Gardein's Holiday Roast at Whole Foods after seeing a few people rave about it online. When I was in line to pay for my groceries, another woman asked me about the Gardein Roast, and she had a Tofurky in her basket. I had Tofurky last year and really enjoyed it, but I thought I'd try something new as Gardein never disappoints. 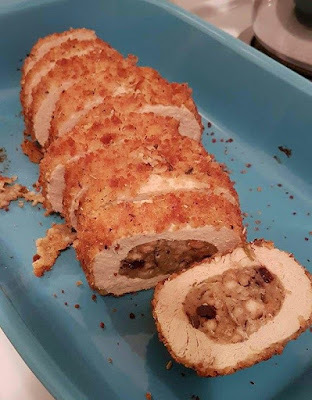 The roast is vegan turkey stuffed with cranberry wild rice stuffing, and the meal comes with two packages of vegan gravy. The roast was really easy to cook, and you don't need to add any sauce to it like you need to do with Tofurky. 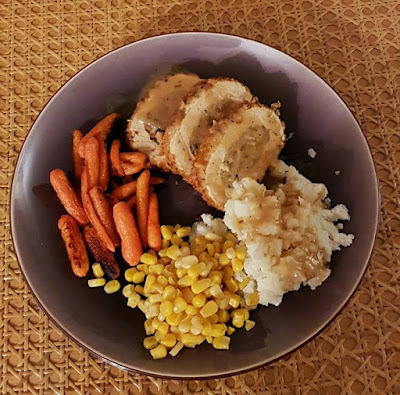 For my sides I made garlic mashed potatoes, peaches & cream corn, and sweet baked carrots. All that was missing were some dinner rolls! Being vegan around the holidays doesn't have to be hard, especially now since there are so many vegan alternatives like this roast from Gardein. If you also had a vegan Thanksgiving then I'd love to hear what you cooked up! I might try making a homemade loaf for Christmas, so if you have any tried & tested recipes then please pass them my way!